As I look at pictures of homeschooling, joy is a word that comes to mind. It is most often expressed when we’re doing hands-on activities and bringing to life what we learn through reading about different subjects. Sometimes, joy comes from the girls making connections on their own. 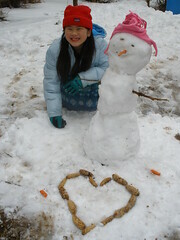 For example, Sophia was having fun building a snowman and making a pinecone heart near it one day during the winter. She was so happy with how both turned out. She put birdseed in the snowman’s hat so the birds had another feeder to visit. She left carrots on the ground for the rabbits or deer. inspired by the book Stranger in the Woods. She told me after she made the snowman that she was thinking about the book, Stranger in the Woods as she was making the snowman. It’s interesting to see how Sophia and Olivia both are inspired by books that I read to them as part of homeschooling, and how that translates into their play and learning. I also see joy in the girls’ faces when they are doing something they love to do and at which they feel skilled. Olivia has always enjoyed coloring and could spend the majority of her days coloring (that…or coloring and doing puzzles). and was wearing as part of the Egyptian unit study. 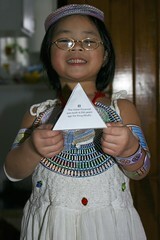 In the photo above, Olivia is holding a paper pyramid that has facts about pyramids on each side. She also is wearing paper jewelry she colored. These weren’t projects that were displayed in the house or worn after multiple times. Rather, she put them on and wanted to show what she did – and she radiated joy. After she was done, she took off the jewelry and carefully put it in her Egypt 3-ring binder in a protective sheet holder. In that way, every time she looks at it, it can remind her of how much she enjoyed coloring at that point in her life. Another time that the girls are joyful is when we spend time cooking and baking together…and then sampling what we made. as part of the geography unit study about Hungary. 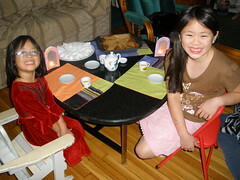 The girls and I have made foods that we enjoyed (like cookies and coffeecake as shown in the picture above). Likewise, we’ve also made some food that none of us would like to eat again (Ukrainian sauerkraut and Welsh Oatcakes). Whether or not we enjoyed the food, the experience of cooking together brought us all a lot of joy and happpiness. We were sharing time and creating special memories that we all can enjoy looking back upon. 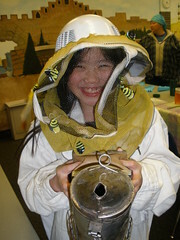 Having opportunities to play and creatively express oneself are important parts of homeschooling as well. Playing, pretending, and dramatic expression all foster creativity and being able to think independently…rather than having someone tell you what to do and when to do it. during a home economics lesson. Being able to exercise together and be outdoors always makes us happy. 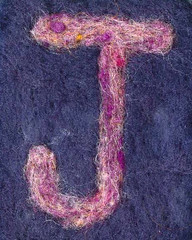 Joy is often shown with huge smiles and laughter, especially when we’re riding bikes; playing badminton or croquet in the backyard; or walking the dogs or horses. 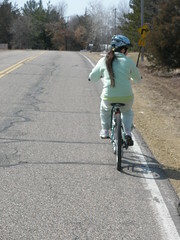 Olivia riding her bike on a beautiful spring day. thus the odd angle of this photo. Living in the country on a small hobby farm means the wheelbarrow is used at least once each week…if not more often. 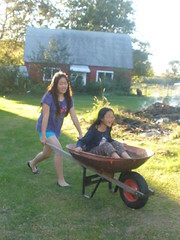 Many times, Sophia gives Olivia rides in the wheelbarrow. No matter where you are here, you can hear Olivia laughing as she’s bumped and jostled on the rides. In addition to having fun, the wheelbarrow rides are good for their bodies. Both girls have sensory integration dysfunction (aka sensory processing disorder), so pushing a heavy load (for Sophia) and getting input from the ride (for Olivia) help address some of the needs that their bodies have because of SID. The girls having fun in the backyard. Since the girls were infants, they have enjoyed swinging. When they were under a year old, they would be pushed and would fall asleep while the wind blew, birds sang, and sun gently warmed them. They were so content and at peace while swinging…a more quiet form of joy. Swinging each day when it’s not raining or well below zero with bone-chilling winds, is both relaxing and exhilarating for the girls…often at the same time. When they have too much energy and can’t focus on learning, taking some time to go on the swings helps get some of the energy out. In the process, they are laughing and joking, and having a wonderful time. They come in awhile later ready to begin homeschooling again. Homeschooling is about joy. And when I think about joy — about happiness — I think of spending time together; creating memories; and learning about new things and gaining new skills. Joy is present each day we homeschool. I know that because I hear it through laughter; and see it through smiles and love shown to one another. during a unit study about the Nez Perce during the 1700s. your joy and you shall form an invincible host against difficulties. This week I continued working on the 30 Days to Simpler Life project. Each day, Fairy Tale Mama at Enchanted Schoolhouse posts an activity from the book 30 Days to a Simpler Life. The projects so far have been ones I’ve wanted to do, but haven’t made the time for…or ones that weren’t on my list of things to do, but have been good to do in an effort to de-clutter and simplify my life. 1. List them and put the list in a binder. 2. Photograph or videotape your valuables. Date the video. 4. Put any appraisals or authentication documents in your binder. 5. Store your valuables binder in a safe place. This is a project that I’m going to have to come back to at a later date. This involves more work than one day. I’ve wanted to do something like this for a long time now. Once I wrap up homeschooling for this school year and have a short break, that will be the time I can tackle this project. Over the past couple of years, I have slowly used up wrapping paper and ribbons; and I have very few bows left. 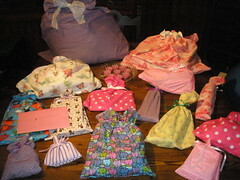 For each birthday and holiday, I’ve been making re-usable gift bags from fabric. The first year when I make the bags, it’s a bit labor-intensive. However, with each subsequent year of use, it’s been a wonderful time saver. Fabric bags I made for Sophia’s birthday. Her favorite colors are pink and purple. 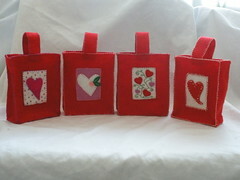 I also have made hand-embroidered bags from wool felt and beads. 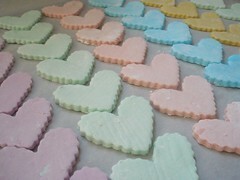 These are a bit time-consuming to make, but they will last many years. If they take care of the bags, they will have them when they leave home and start their own families. Perhaps they can be passed onto their children. for Valentine’s Day for the girls. Day #24 – Create Hassle-Free Holidays – Make a list of the holidays you celebrate annually. Besides each entry, write down what each holiday means to you. For example, Thanksgiving may mean organizing a big potluck dinner for friends who don’t have anyplace else to go. Many of the joyful activities for the holidays centers around food and making food that ties in with the holidays. St. Lucia dinner. 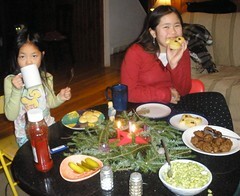 The girls and I made St. Lucia buns and Swedish meatballs. The buns are ones that we have been making for many years now. The Swedish meatball recipe was a new one we tried in 2010. I also find joy in helping the girls with their costumes for Halloween. Often they want their hair done, so they have their hair up in curlers (the kind they have to wear overnight) or hot rollers; and get the final touch with the curling iron. All dressed up in 2007 for Halloween. 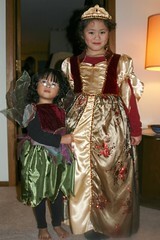 Olivia was a fairy and Sophia was a princess. I’m not one who enjoys huge crowds. 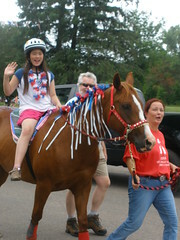 However, the girls had an opportunity to ride horses on the Fourth of July in a small town parade. Since they were in the parade prep area, there were quieter places to sit which was nice. There weren’t the crowds in that area…and the view was unobstructed. Sophia riding in the 4th of July parade in 2010. One of the ways we celebrate New Year’s Day is by going to a Chinese restaurant. This tradition was started in the early 1990s in San Francisco where there seemed to be a huge number of Chinese restaurants. It is continued to this day, and enjoyed by us all. 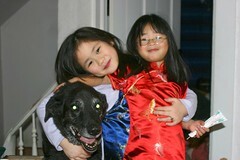 The girls dressed up in their Chinese dresses in 2008. 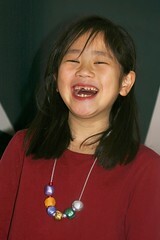 These were purchased in China (where they were adopted from) in 2001 and 2003. I brought back a variety of dresses in increasingly larger sizes so they could have special dresses to wear each year. for the annual New Year’s Day dinner. As I looked the holidays for the year, I realized that for several of them, we don’t do anything special to celebrate them (e.g., Memorial Day, Labor Day). It might be nice to find a free activity in the community and do that, or have a picnic or go on a short day-trip to a place that we haven’t gone before. For me, things that are stressful center around large crowds and public chaos – big events, parades, and even children’s services at the church where the girls sing. Maybe I’m just getting old, but I seem to prefer quiet, peaceful gatherings…or ones that I can go to early to avoid crowds. At least I know what I find stressful and can try to avoid activities that I know will be too loud or where there are too many people crammed in too tight of an area. I have started to remove photographs from old photo albums (the kind that are pre-archival quality) and place the photographs in achival-quality boxes. I’ve been working on and off on this project for a couple of months now since I have quite a few albums to go through. I use to operate a children’s camp and found that I had taken a tremendous amount of photographs of the program. 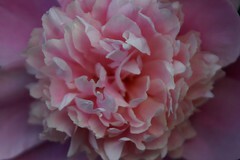 Some of the photographs were sent to funders, but I kept many of them and put them in albums. I kept some of the photos that had pictures of the girls, farm animals (sheep, chickens, horses), or were personally meaningful to me. As I’m going through the photographs, I’m not keeping all of them. 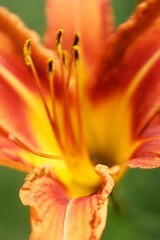 For some photos, I’m sending them to people (friends and family) who I think may enjoy them. For example, if their child participated in the camp program, they might enjoy seeing a photo of their child at camp when they were much younger. 1. Do I use it—or think I should? If not, toss it. 2. When I want to do a project, is this item ready to use? Am I willing to keep it cleaned and repaired? If not, toss it. 3. Do I have enough space for this and is it well located? If not, toss it or move it. I don’t have a garage, so the closest thing that’s like garage that’s here is the hobby shed and barn. Outside of the hobby shed. Back in late-August and early-September 2010, I spent a lot of time cleaning out the shed and getting rid of a lot of items that were no longer good, usuable, or had been damaged by being in a non-temperature-controlled building. I had been storing clothing for the girls that they could grow into as well as holiday items in the hobby shed. Unfortunately, some of the things that had been in there for multiple seasons (mostly clothing, some blankets, and pillows) now smelled like mildew which wasn’t good. Because the smell was so strong, the items now were garbage. As the dumpster was slowly filling, it was a very sick feeling to see not only items that were once good that were ruined because of inadequate storage space, but I thought about the money that was wasted that I would never get back. It was a financial loss…and not a positive impact on the environment by any stretch of the imagination. 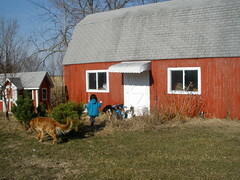 When it gets warmer, I plan to re-visit organizing and further de-cluttering the hobby shed. It is more than a day’s work; and more appropriate to do later in the spring or summer. At the same time, I will clean out the barn and shed again. After this round, things should be much better. I’ve been gradually adding more perennials and wildflowers over the years. Some have done well, while others haven’t and were a waste of money. 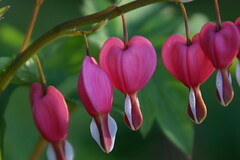 The ones that seem to do the best here are hostas, ferns, siberian irises, lupines, peonies, hydrageneas, bleeding hearts, lilies, and some roses. 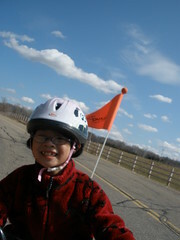 Now that the weather is better, we can begin riding our bikes again which is fun. Olivia is still learning how to ride a bike, so I have a modified bike hooked up to mine until she can ride on her own and keep up with Sophia and me. Olivia and me riding our bikes. I also typed a physical education chart in which each of us can mark off when we do some form of exercise for the day. It can be bike riding, working with the horses, taking the dogs for a walk, going on a nature walk, or playing in the backyard. The key for us is variety and fun more so than an extreme workout. The focus of Day 3 of the No Impact Week Experiment is to examine the transportation that one uses. When I use to live in Minneapolis and San Francisco, I would use public transportation since it was convenient, cost-effective, and helped the environment. I particularly liked San Francisco’s system which is referred to as Muni. Founded in 1912, Muni is one of America’s oldest public transit agencies and today carries over 200 million customers per year. Muni provides transit service within the city and county of San Francisco 24 hours a day, 7 days a week. Muni operates approximately 80 routes throughout San Francisco with stops within 2 blocks of 90% of all residences in the city. Operating historic streetcars, modern light rail vehicles, diesel buses, alternative fuel vehicles, electric trolley coaches, and the world famous cable cars, Muni’s fleet is among the most diverse in the world. Currently, the closest public transportation is about 13 miles away from home. There’s a bus service that began a couple of years ago that connects residents to the downtown areas. It departs in the morning and arrives back in the afternoon (after work). I haven’t used the bus service yet since I don’t work in the city. When I did work in the city many years ago, I used a vanpool which was great. I woke up early and drove about 14 miles to the nearest city where the pickup point was located. A driver picked up the riders and we drove together downtown. In the afternoon, the van picked me up right outside my office and drove me back. There were many days that I was so thankful that I wasn’t the one driving in the snow or ice. Now, I’m at home the majority of the time homeschooling my daughters. My business, Harvest Moon by Hand, is located at home so I don’t have to commute. This saves money and environmental resources. Sophia riding her old bike in the front yard. She now has a small women’s bike (which should last through high school). 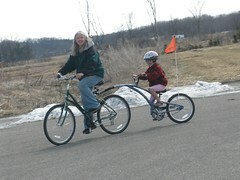 I have a women’s bike with an attached tandem bike for Olivia. 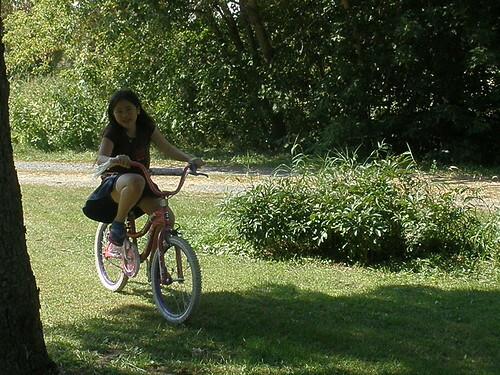 In May 2010, my daughters and I got bicycles with the hope that we could do some of our errands and spend some of our recreational time biking. We ended up going on many bike rides, but all were recreational. We had hoped to bike to the Post Office, chiropractor, and local supermarket for a treat (about 2 1/2 miles away from home), but haven’t figured out a relatively safe route for us to go. The main road to get there does not have a bike path (it is a County Road with vehicles moving at least 55 mph). It is a bit unnerving to have cars and trucks speed by…especially with two children under the age of 10 years old. 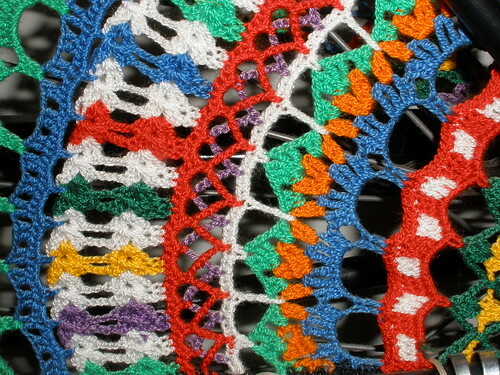 Crocheted bike wheel cover. This was in a museum in Pella, Iowa. When I take the girls to a homeschool co-op on Mondays, I try to do all the errands for the week. This saves a lot of time, gasoline, and wear-and-tear on the car. I try to shop only twice a month at the grocery store, so that I’m not spending all my time at the grocery store each Monday. Rather, I can accomplish a variety of errands and use my time wisely. cuts a typical vehicle‘s fuel economy by up to 2%. The above fact how excess weight in the trunk ﻿affects a car’s fuel consumption prompted me to clean out the car. The car didn’t have 100 pounds of items in it, however it was good to take out the items that were not being used. With winter, some items need to go back into the car – like wool blankets, ice melt, and window scrapers. It’s good to have these items on hand and to be prepared…especially with the cold weather. I’m looking forward to less than 90 days from now when warmer weather appears and there will be no need for window scrapers and wool blankets! 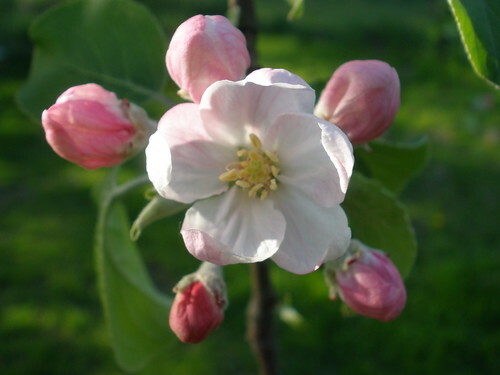 One of the signs of spring…blossoms on the apple tree in the backyard.